Uhl's Anomaly is a rare cardiac condition in which there is total absence of right ventricular myocardium resulting in apposition of the endocardium and epicardium. We report a case of Uhl's anomaly in a 3-week-old infant female who was presented with cyanosis. 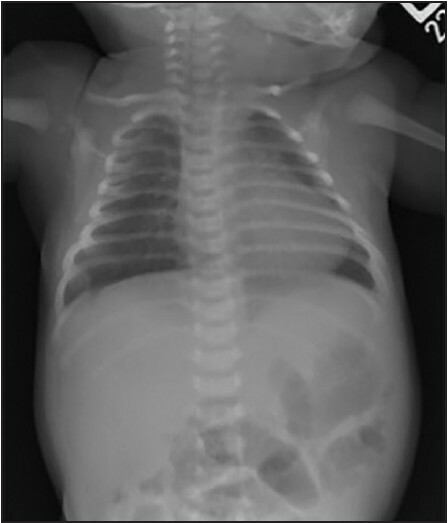 An infant female presented to the emergency department at 3 weeks of age with emesis. Her room air saturation was 43%, which increased to 73% with supplemental oxygen. Her chest X-ray was unremarkable [Figure 2]. An initial echocardiogram demonstrated a severely dilated right ventricle with decreased function and a dilated right atrium and hepatic veins. There was a restrictive atrial communication shunting right to left with a mean gradient of 8 mmHg. She was taken to the cardiac catheterization lab for an atrial septostomy for suspected total anomalous pulmonary venous return and pulmonary hypertension. Following the septostomy her oxygen saturations deteriorated severely. Balloon occlusion of the atrial septum was performed after which the oxygen saturation and vital signs improved. A pulmonary arteriogram showed sluggish pulmonary blood flow with normal pulmonary venous return to the left atrium. Her pulmonary artery pressures were low. She was placed on veno-arterial extra corporeal membrane oxygenator (ECMO) due to an inability to adequately oxygenate coupled with biventricular systolic dysfunction. While on ECMO support her left ventricular function improved; however, right ventricular function remained severely depressed. Despite the previous catheterization data, the diagnostic and therapeutic target was pulmonary hypertension, and thus she underwent an open lung biopsy to rule out pulmonary capillary alveolar dysplasia as a cause of severe pulmonary hypertension. Further misdirecting the management, the biopsy results were consistent with changes due to pulmonary hypertension including mild medial hypertrophy of small arterial vessels. It did not show any signs of capillary alveolar dysplasia or other diseases consistent with the child's clinical condition. Continued assessment with 2D echocardiograms did not show any improvement in right ventricular function. After several days on ECMO and with discussions including the cardiology team, she underwent repeat cardiac catheterization, which confirmed the low pulmonary artery pressures and decreased right ventricle (RV) function. The coronary artery anatomy was normal. The diagnosis of isolated RV cardiomyopathy was then entertained, and she was taken to the operating room for a central shunt along with patent ductus arteriosus (PDA) and main pulmonary artery (MPA) ligation and RV biopsy. 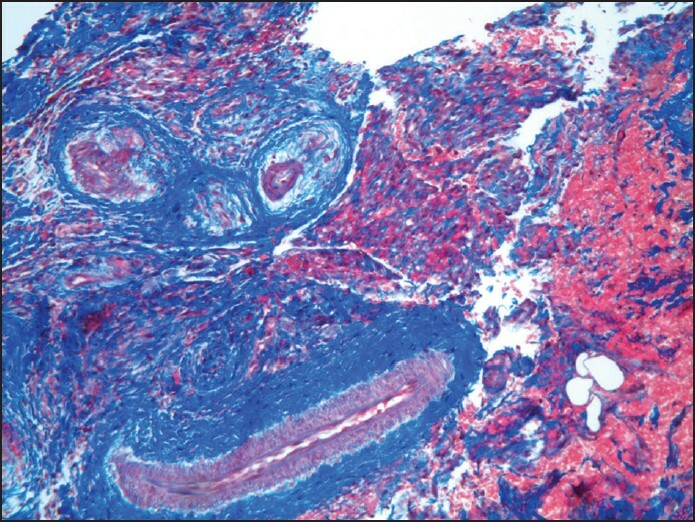 The specimen showed complete absence of myocardial striated muscle and instead consisted of dense and loose fibro-connective tissue with prominent blood vessels and small amount of epicardial fat, all consistent with Uhl's anomaly [Figure 1]. Post-operatively she could be weaned slowly from mechanical circulatory support. She was ultimately discharged home with plans to follow a single ventricle palliation pathway. Diagnosis is frequently made by imaging studies such as an echocardiogram or cardiac magnetic resonance imaging, and can be confirmed by a myocardial biopsy. In this case, due to the rarity of this disease, the diagnosis was not considered until it became clear that the patient had right ventricular failure in the absence of increased pulmonary vascular resistance. Initially, other more common causes of poor right ventricular systolic shortening, sluggish pulmonary blood flow and cyanosis were entertained. The data regarding the pulmonary artery pressures from the initial catheterization was not fully appreciated until it became obvious that the child's course was not improving despite maximal therapies directed at lowering the pulmonary vascular resistance. There are several descriptions of various surgical approaches to the management of Uhl's anomaly including: A bidirectional Glenn with atrial septectomy and disconnection of the MPA followed by plicating of the RV cavity, one and a half ventricle repair with partial right ventriculectomy, and cardiac transplantation. ,, These approaches all report surgical success; however there is no agreement on the definitive approach. To enable the team to gather sufficient data and devise an approach for surgical management, a prostaglandin infusion can be initiated to provide pulmonary blood flow. In this situation, the absence of pulmonary valve insufficiency should be assured. In summary, Uhl's anomaly is a rare form of right ventricular failure in infants and can masquerade as pulmonary hypertension due to the isolated findings of right ventricular dilation, cyanosis and decreased right ventricular shortening. However, this disease entity should be kept in the differential until the pulmonary vascular resistance can be accurately assessed. Goldstein, Jeffrey, MD. Provided biopsy pictures that diagnosed Uhl's anomaly, and description of the pathological findings seen on the biopsy. The case was presented as a poster at University of Florida Research Day 2014 at University of Florida Health Science Center - Jacksonville. Date of presentation was May 15 th , 2014. Osler WM. The Principles and Practice of Medicine. 6 th ed. New York: D. Appleton, 1905. p.280. Uhl HS. A previously underscribed congenital malformation of the heart: Almost total absence of the myocardium of the right ventricle. Bull Johns Hopkins Hosp1952;91:197-209. Uhl HS. Uhl'sanomaly revisited. Circulation 1996;93:1483-4. Gerlis LM, Schmidt-Ott SC, Ho SY, Anderson RH. Dysplastic conditions of the right ventricular myocardium: Uhl's anomaly vsarrythmogenic right ventricular dysplasia. Br Heart J 1993;69: 142-50. Ikari NM, Azeka E, Aiello VD, Atik, E, Barbero-Marcial M, Ebaid M. Uhl'sanomaly. Differential diagnosis and indication for cardiac transplantation in an infant.Arq Bras Cardiol2001;77:69-76. Pamuru PR, DokuparthiMV, Remersu S, Calambur N, Nallari P. Comparison of Uhl's anomaly, right ventricular outflow tract ventricular tachycardia (RVOT VT) & arrhythmogenic right ventricular dysplasia/cardiomyopathy (ARVD/C) with an insight into genetics of ARVD/C.Indian J Med Res 2010;131:35-45. Richardson JD, Teo KS, Bertaso AG, Wong DT, Disney P, Worthley SG. Uhl'sanomaly. Int J Cardiol 2012;154:e36-7. Azhari N, Assaqqat M, Bulbul Z. Successful surgical repair of Uhl'sanomaly.Cardiol Young 2002;12:192-5. James TN, Nichols MM, Sapire DW, DiPatre PL, Lopez SM.Complete heart block and fatal right ventricular failure in an infant.Circulation 1996;93:1588-600. Takizawa K, Suzuki S, Honda Y, Kaga S, Inoue H, Matsumoto M. Long-term survival of Uhl'sanomaly with total cavopulmonary conversion. Asian CardiovascThorac Ann2009;17:203-5.